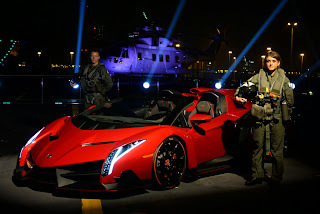 The Lamborghini Veneno Roadster made its public debut on board the Italian naval aircraft carrier Nave Cavour. was formally unveiled on the flight deck of the 240 m ship while docked in Abu Dhabi's Mina Zayed port. "The Lamborghini Veneno Roadster is one of the world's most exclusive cars with the most extraordinary performance," said Stephan Winkelmann, President and CEO of Lamborghini. "We are honored that Lamborghini was chosen to represent the Italian car industry in the UAE, as a perfect example of iconic Italian super sports cars, and that we have the opportunity to show the Veneno Roadster for the first time in Abu Dhabi. Lamborghini has an extremely strong following in the region for its super sports cars, with the Middle East one of our largest markets in the world." The Lamborghini Veneno Roadster is a fully road legal, open top car, bringing the aerodynamic efficiency of a racing prototype to the road, with extreme design and breathtaking performance. The nine units will be built during 2014, priced at 3.3-million euros excluding taxes. With a maximum power output of 552 kw/750 hp, the V12 Veneno Roadster accelerates from 0 to 100 km/h in just 2.9 seconds, with a top speed of 355 km/h. Shown in Abu Dhabi in the specially developed colour 'Rosso Veneno', each client will be able to individualize the colour of his Veneno Roadster to suit their personal preference. 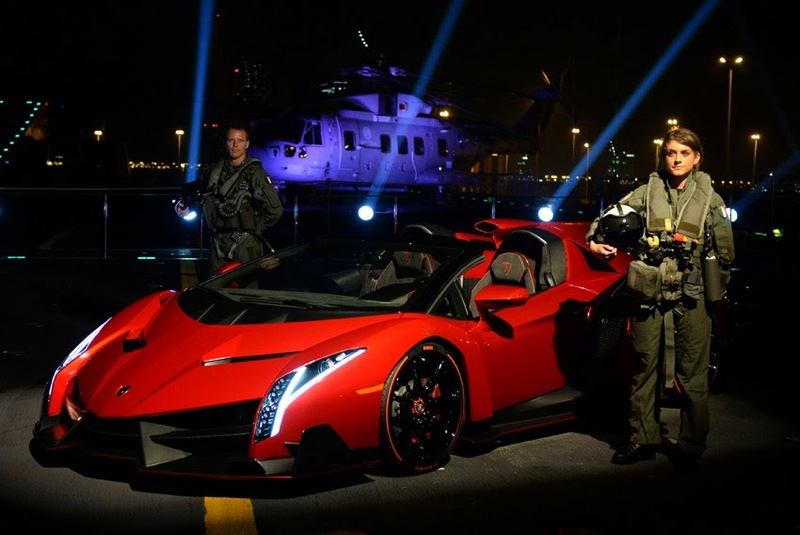 The Lamborghini Veneno Roadster was unveiled in the presence of His Excellency Giorgio Starace, Italian Ambassador to the UAE and the Admiral of High Seas Forces, Paolo Treu. Guests on board Nave Cavour enjoyed hospitality from chef Corrado Corti of Italy's famous Hotel Splendido in Portofino, who flew in especially for the occasion. Singer and actress Elena Bonelli opened the event with the Italian national anthem; fashion designer Giada Curti offered a tableau vivant of her creations with ten top models. One of the happy few to sit in the Veneno Roadster was former captain of the national Italian soccer team and 2006 world champion Fabio Cannavaro.